It’s telling that every adaptation of The Tick has become more and more realistic, if not in story, then at least in tone. The 1994 animated series parodied superhero tropes on the most superficial (yet still entertaining) level, exploring the now well-tread idea that perhaps the good guys cause more damage to their surroundings than they prevent. 2001’s subsequent live-action reboot, while similarly silly, was able to build a more believable world that somehow felt closer to the comics, simply because it had high production value and flesh-and-blood actors. The generically named setting (simply “The City”) and its costumed denizens were still cartoons, but they were cartoons you could almost reach out and touch. The 2001 series still feels closest to Ben Edlund’s comic, and will likely always be seen by some fans as the truest adaptation of the source material. Edlund probably sees it that way, too. These days, however, he doesn’t seem quite as interested in creating something that perfectly captures the true-blue (emphasis on the “blue”) spirit of his pages. He already did that. He’s already poked enough fun at the absurdity inherent in any superhero narrative. What if he could do something else with The Tick? What if he could go deeper? What if he could go darker? That’s exactly what he does in his new pilot for Amazon. And for any diehard who protests its stranger, sadder tone, remember, this was created by the guy who dreamed up The Tick in the first place. 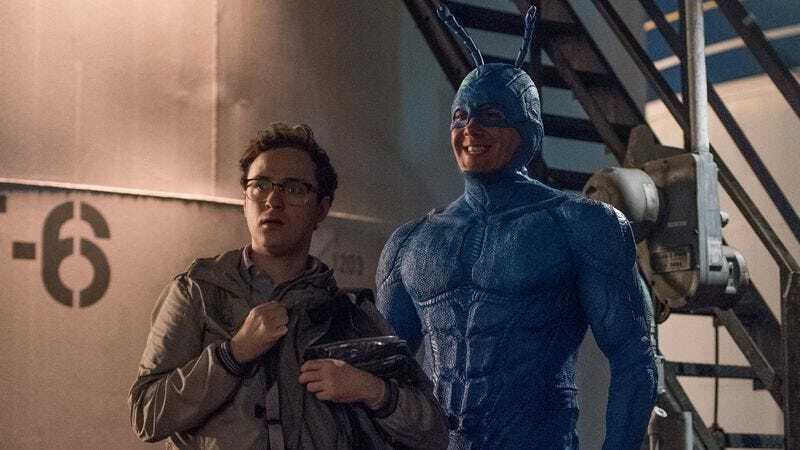 Here, the protagonist isn’t The Tick at all, but his mild-mannered sidekick, Arthur (Griffin Newman). As a kid, he witnessed his father being crushed to death by the downed aircraft of superhero team The Flag Five. Shortly afterwards, they stumble out of the wreckage, virally blinded and soon dispatched by the Tick universe’s big baddie, The Terror (Jackie Earle Haley, continuing to kill it in adventurous, dangerous comic-book adaptations). To rub salt in the wound, The Terror stares down young Arthur and eats all of his ice cream in one, messy gulp. The image gets depicted on the cover of Time magazine, and for the rest of his life, Arthur can’t escape reliving his worst nightmare. In the usual comic-book narrative—say Batman, Spider-Man, or Daredevil—Arthur would have immediately formulated a plan for vengeance, a plan that would eventually evolve into fighting for the greater good of humankind. But instead, he acts like most of us would act: becoming traumatized, obsessive, and mentally unhinged in a world where caped murderers are an everyday occurrence. Although The Flag Five didn’t intentionally kill his father with their ship, they visually played just as big a role in his father’s death as The Terror. Maybe even more so. In that way, this new Tick is an example of what happens when the superhero origin story goes wrong or, more accurately, goes realistic. Even if the costumes are still grotesque and exaggerated (though more muted in color) than any of the previous Tick adaptations, the acting is completely straight-laced. Haley emits a growl that’s as deadpan as it is sadistic, and that’s much more terrifying than if he played The Terror with cartoonish glee. It creates a tonal tension that’s confusing in all the right ways. That applies tenfold to The Tick himself. Peter Sarafinowicz delivers the same nonsensical pep talks as Patrick Warburton and Townsend Coleman before him, but with a more off-kilter stare that betrays the confidence in his voice. That juxtaposition, coupled with his smaller frame and lack of a square jaw, make his ramblings more akin to someone having hallucinations than a more traditional superhero. While TV certainly doesn’t need another Fight Club twist these days, The Tick still uses this potential curveball in the best way possible. If the titular hero isn’t real, he becomes a symbol of Arthur’s darker, violent impulses. He becomes a hazardous tool for bringing change to The City. But what happens when that change goes awry? What happens when he becomes more Tick than Arthur? And if The Tick is indeed real, it’s still an equally dangerous partnership: one mentally unstable guy who has unchecked physical strength and another mentally unstable guy with brains and an obsessive personality. Plus they’re both dressed like insects (okay, one insect and one arachnid). All of that makes this bizarre new take on The Big Blue Bug The Dark Knight to the 2001 show’s Batman: The Animated Series. The latter’s certainly more faithful to the original, but the former has a lot more to say. It was great to hear someone once again confusing Arthur’s moth suit with a bunny costume, albeit in a more serious fashion. Although I didn’t get into it above, Griffin Newman really is pitch-perfect as Arthur, nailing the self-aware panic surrounding his mental state, yet never mustering the power to keep himself calm. What say the rest of you on the real/not-real nature of The Tick? Gizmodo also pointed out the argument, but we could all be completely wrong about the whole thing.